Each year, hundreds of outdoor enthusiasts descend on Mt. St. Helens.... in dresses. Learn the history of this awesome tradition and add it to your calendar for next year. Nearly 33-years ago, on a balmy spring Saturday in Whitefish, Montana, my mom was 41-weeks pregnant and mowing the lawn. As I would be in life, I was stubborn in birth and had made myself quite cozy in her belly for an extra week. The doctor told my mother that being active would hurry me along and the lawn needed attention, so she was mowing when the contractions finally started on Saturday afternoon. I was born 16-hours later at 5:26 am on Sunday, May 13. It was Mother’s Day. Mother’s Day always falls on the second Sunday in May. Because I made my appearance into this world on that very day – officially making my mom a mom – it holds a special meaning for us. When I lived at home celebrating was easy, but it got harder after I moved away. I’d been living in Seattle for 10 years by the time I heard about the Mother’s Day tradition, and I knew immediately I had to go in honor of “Ma”. Lucky for me, I had just the crew to join me. The Mother’s Day tradition on St. Helens dates to 1987 and a woman named Kathy Phibbs. A climbing guide often described as a ‘firecracker’, Kathy lived a life of passion and perseverance. She made numerous first female ascents in Peru and Bolivia, and she led 33 women to the top of Mount Rainier to commemorate the centennial of its first ascent by a woman — Tacoma teacher, Fay Fuller. Before she worked as a guide and opened the northwest office of Woodswoman, Kathy made a living as a window-washer, messenger, and chimney sweep. She founded Women Climbers Northwest (WCN) in 1983, a small, close-knit organization created to encourage women to be more active in the mountains and share adventures together. At the time, climbing was a male-dominated sport. Kathy wanted more women to get outside and take on leadership roles. With passion an generosity, Kathy created a community where women were welcomed with open arms… and a tutu. Her spirit of adventure took Kathy to Mount St. Helens in the spring of 1987. After a 7-year restriction, climbing permits were being issued for the first time since the 1980 eruption. Kathy felt a celebration was in order and wore a red chiffon dress to mark the occasion. Her companions? Five girlfriends… dressed as can-can dancers. 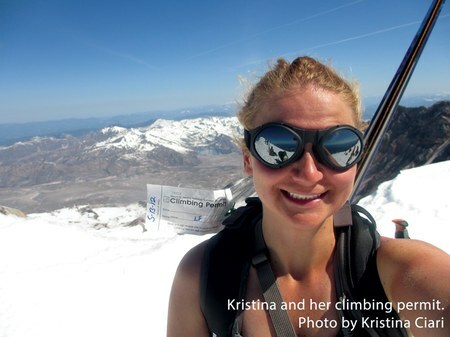 Kathy died tragically in a winter climbing accident on Dragontail Peak in 1991, but the tradition of climbing St. Helens on Mother’s Day lives on. People embraced the spirit as soon as the Seattle Times story ran in print. Kathy Phibbs, and her vision to bring a change to the PNW climbing community, left a long lasting legacy for all to enjoy. 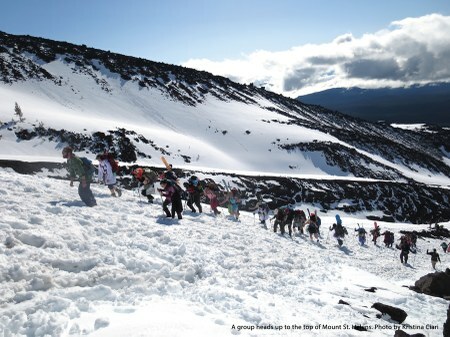 Nearly everyone who climbs St. Helens on Mother's Day is in a dress. Men, women, children, dogs (leashed, of course) - outdoor enthusiasts definitely embrace the spirit. The tradition is celebrating its 30th birthday this year, and locals know the drill: in the coming weeks, the 500 folks who secured climbing permits will make their annual pilgrimage to Goodwill to find the perfect ensemble. Dresses are just the start. Hats, scarves, long gloves, boas, and yes - tutus - are all part of the fun. In preparation for the trip, climbers will pack their costumes with the same love and care as their climbing packs. On Saturday afternoon of the celebratory weekend, they’ll drive to the mountain, pull into Marble Mountain Sno-Park, and set up camp for the night. Then, by headlight at the wee-hours of the alpine-start morning, everyone will don their Sunday Best and start up the mountain. As the sun rises, they’ll see sparkles off sequined dresses all the way to the summit. Once there, the celebration really begins. The climb itself covers 5,500 vertical feet in 6 miles (one way). The average mountaineer can cover the distance to the summit in 4-6 hours. Anyone climbing above 4800’ is required to have a permit. One of the reasons St. Helens became so popular on Mother’s Day Weekend is that, prior to 2015, it was the last weekend during the April-May climbing season during which permits were uncapped. Starting on the third Monday in May every year, climbing use is restricted to 100 permits per day. But before that fateful Monday, all you had to do was show up with $22 and a permit was yours. Due to the popularity of the tradition and the need to manage human impact, Gifford Pinchot National Forest issued a permit cap of 500 in 2015. Prior to the cap, it’s estimated well over 1,000 people submitted in a single day. I remember the energy that fateful Sunday, May 11, 2014. It was my third trip. When I climbed the mountain for the first time in 2012, I spent days scouring the local racks before deciding to wear an old bridesmaid dress in honor of the occasion. By now I knew better. 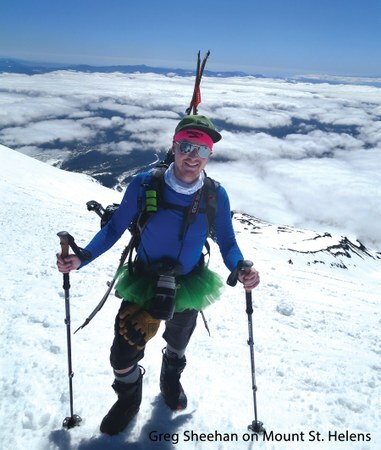 Just like Kathy Phibbs, I was wearing a tutu, as I had in all of my outdoor adventures since finding inspiration in the ridiculousness of St. Helens two years prior. 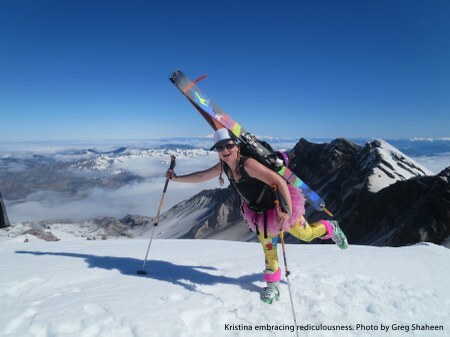 Since discovering and falling in love with this tradition, I have taken great pleasure in introducing other skiers and climbers to the joys of climbing in a dress, and more specifically a tutu. Out of all of the folks I’ve convinced to join me, my friend Greg Sheehan embraced the tradition the most. 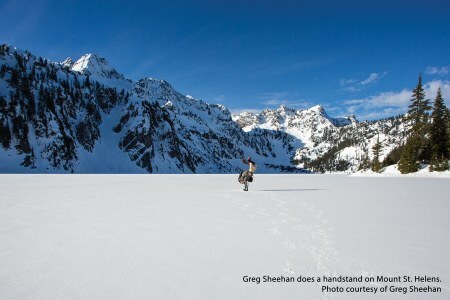 Greg joined The Mountaineers January of 2014, after attending a film at our Seattle Program Center. He watched "Mile... Mile and a Half" about the John Muir Trail, and was inspired to join to share his passions. “The bookstore, resources, and films made me want to join the best outdoor community,” he said. It was around this time that I first met Greg. I don’t recall where we met, but I remember learning that he loved the outdoors, medium-rare steak, and Seahawks football. After bonding over the aforementioned, and drooling at some of his outstanding adventure photos, we made plans to go skiing together. Unfortunately, the weather didn’t cooperate and we had to take a rain check. The next time we could both make it to the mountains was Mother’s Day. 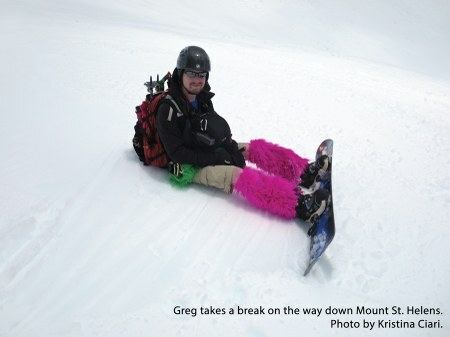 I noticed the tutu and the lopsided a-frame of Greg’s splitboard on his pack before I saw the fur leg warmers. But once I saw those, there was no unseeing them. Especially when hiking next to them for close to 5 hours. After taking in the views together at the top with 1,000 of our new best friends, Greg and I put on our planks and swished our way to the bottom of the snow. Or that’s how it would have gone had conditions been more favorable. Instead, we suffered through some of the stickiest snow I’ve ever experienced. It was bad. Even by Pacific Northwest standards. Moms really are the best. Permits can be purchased in advance online and went on sale this year, February 1. In researching this article, we talked to the folks at Mount St. Helens institute and learned the permits for Mother’s Day sold out in 8-hours. Their staff recommended looking at purmit.com, a “second-hand” website for permits. Be a responsible recreationist. Climb with a permit. Hi everyone - my fiance and I would love to join! Jen lost her mom this past year, and this fun/frolicky outdoor trip would be the perfect camaraderie to celebrate. But we were late to the permit process...if you know of anyone who would like to cancel, we'd love to pay for their permit, and also help their good karma travel into the woods even when they can't! meant to read, "celebrate her mom's life." Obviously.